Using a method I discovered in 1993, I grind away on the reverse sides of photographs with various-sized sanders to achieve these effects. The physical gesture of rhythmically moving the sander back and forth across the plane is not unlike that of using graphite or pen and ink in constructing an image, yet one disfigures and one configures. Even the act of stressing the page with a power tool until the paper almost falls apart must be just as carefully done as a fine drawing. In this process of erasure, the gapsthe negative spacesare as important as the image that remains. 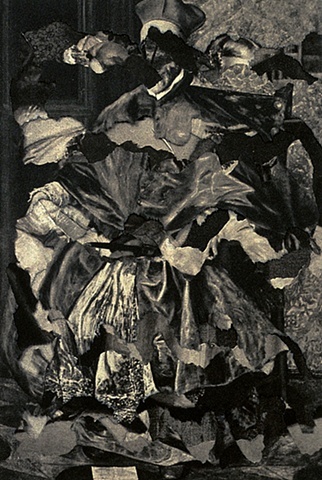 The original impressions of the art in the photographic reproduction is chiseled away until other representational shapes, even alternate portraits, can be made out across the frayed and broken surfaces.